If you want the best and safest for your dog then use stainless steel pails. 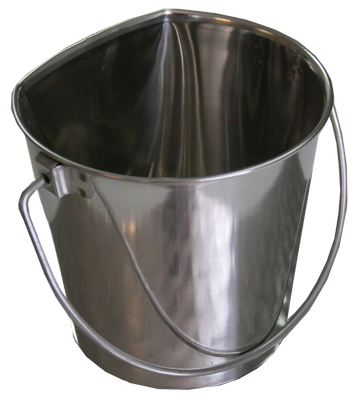 This is a flat sided stainless steel pail perfect for crate or kennel. All of our flat sided pails have no exposed wires on them. Exposed wires are dangerous and dogs tend to catch their collars on them. No more spilled water in the crate with a flat sided pail that can attach and hang inside the crate. Nothing worse then arriving at training and your dog is wet from laying on his/her wet crate floor. Our Aluminum crates have a bar welded inside the crate door to attach these quality stainless steel pails. Four sizes available, double ended snap hook sold separately.